RBTH presents a selection of views from leading Russian media on international events, featuring a report on Sweden’s decision to break off military collaboration with Russia, a summary of the brief campaign for the parliamentary elections in Ukraine, and analysis of the appointment of a new body of officials at the EU Commission. The Moskovsky Komsomolets newspaper reports that due to the "Russian submarine accident" Sweden is breaking off its military cooperation with Russia. 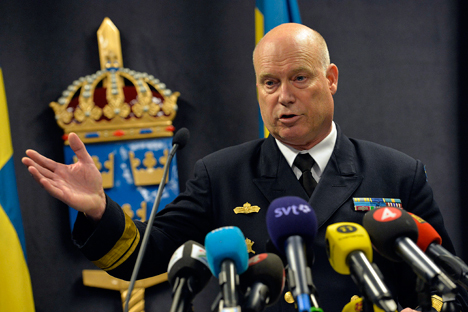 Stockholm not only did not find the mysterious submarine, but also did not believe Moscow's statements. The newspaper writes that Sweden's trust of its eastern neighbor has diminished. The country's government has decided not to prolong its exchange programs with Russia in the defense industry. Stockholm does not hide the fact that the reason for ending the cooperation is precisely the notorious submarine. Arkady Ryabchenko, a Scandinavian scholar at the Immanuel Kant Baltic Federal University in Kaliningrad, told Moskovsky Komsomolets that Sweden has a very powerful weapons lobby. It is believed that mass media hype about the "Russian threat" has already been used on several occasions to successfully give someone advantageous military contracts. There are also political forces striving to have Sweden join NATO. For them the "Russian threat" would be very useful, according to Ryabchenko. The Novaya Gazeta newspaper sums up the unprecedentedly short parliamentary campaign in Ukraine. The publication reports that the lists of practically all the democratic representatives include "either commanders or cult heroes such as Nadiya Savchenko who fought in the East." According to the newspaper's experts, this factor is capable of influencing voters’ decision: Patriotic fervor and the desire for a victorious peace will determine the mood of a substantial part of citizens in the country's central and western regions. The newspaper reminds its readers that in Crimea, as in the Donetsk and Lugansk regions, most of which are controlled by the rebels, elections will not take place at all. This means 30 fewer districts, which is why the parliament will have not 450, but 420 deputies. The newspaper writes that the opposition's rhetoric is based on the criticism of everything that the Maidan government has done and not done thus far, but even more, on the predictions of future disasters related to Kiev’s policies of European integration. Sociologists' predictions of the results of the elections vary greatly: Some say that eight parties will enter parliament, others say only four. The only opinion that they have in common is that Petro Poroshenko's block is currently in the lead. "The European Union is indulging in sanctions to the detriment of its economy": This is the title of an article that has appeared in the Nezavisimaya Gazeta newspaper about the appointment of the EU Commission's new officials, headed by Jean-Claude Juncker. The exiting team of Portuguese José Manuel Barroso, who presided over the EU Commission for 10 consecutive years, leaves the Brussels administration with a number of problems, reports Nezavisimaya Gazeta. "He tried hard, pushing the EU into an impasse of anti-Russian sanctions, which do not make overcoming the crisis any easier, to say the least," writes the newspaper. Moreover, more and more contradictions, dissatisfaction and distrust are growing within the community. As an example, the newspaper cites the UK, which does not exclude the possibility of carrying out a referendum on future EU membership. In order to manage his predecessor's negative legacy and choose a more balanced policy, Juncker's team will need lots of flexibility and realism, according to the newspaper. The anti-Russian sanctions, which are being used to unite the EU, do not look very convincing. Many countries consider them meaningless and would not mind returning to policies oriented towards Europe-wide cooperation, concludes Nezavisimaya Gazeta.